Create online, enjoy on paper. 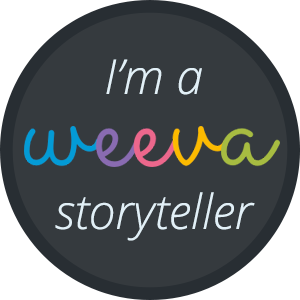 Weeva creates art-quality books filled with precious stories and photos collected from your family and friends using Weeva's free online tools. My Tapestry that I dedicated to my daughter's is just about done. Some of my threads include, How they bonded, Holidays, Birthdays, and so much more. The hardest part for me is reading my members memories. It's a beautiful, emotional process. This Keepsake Book is going to be something I will cherish for the rest of my life. I honestly can't wait to finish and receive my "hard copy." My favorite thing about Weeva is that my Tapestry is private and invite-only. So to see what's in my Weeva Tapestry and to be able to add to it you must be invited by me or someone who is already a member of that Tapestry. I still think the hardest part for me is to actually write about their memories. I get emotional or can't seem to word it the correct way. Another reason why I love that I can add members. They can help me word it the right way or fix a simple typo. Yes, I'm guilty of typos. Aren't we all? ;) Weeva truly makes the best One of a Kind Gifts. My girls may not understand it now but when they are teenagers and have an "argument" they can read this book and remember all the good things. I love that they can read their grandparents, aunts, uncles, and cousins memories. Ordering my masterpiece couldn't be easier, all I have to do is write and collect my stories. Weeva does the rest. Simple, right? Once I receive my "hard copy" of my Keepsake Book for my Daughter's. I will share it with you. It sounds very interesting. I once turned my oldest son's blog into a book for his first year. I feel bad that I haven't done that with my second son. I wonder if this would be something I could use for that. This sounds like a very cool book! It's cool to put pictures and memories all in one place! That sounds awesome. I always get my parents a photo book for Christmas and this sounds like the way to go! This looks like a fun way to preserve memories! Thanks for sharing this fun product. I am definitely going to check it out further! This is a great way to capture memories. What a unique keepsake. I think this whole thing sounds so wonderful. It's an heirloom in the making.